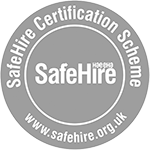 We have just been awarded the prestigious SafeHire certification. SafeHire has been developed by Hire Association of Europe/Event Hire Association for the hire and rental industry with the assistance of BSI. It demonstrates the Association’s commitment to guiding organisations to achieve higher standards and constantly improve their service delivery levels whilst adopting core business principles relevant to all organisations. Hire Association Europe Managing Director Graham Arundell said: "This certification ensures that Plato Catering Hire is fully committed to looking after their clients by having safe equipment available for hire. Our independent assessors have carried out a detailed examination of their operations, including a review of the servicing and testing procedures implemented to make sure that all equipment is safe before it is hired. They have also checked to ensure that all clients are provided with correct safety instructions. In addition, throughout the certification period, there is an ongoing assessment process to ensure that these high standards are being maintained."